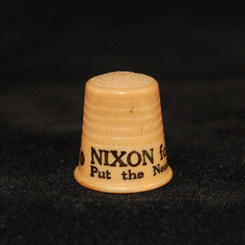 About this object This piece of election memorabilia, aimed at attracting women voters, read “Nixon for Congress” and “Put the Needle to the P.A.C.,” a jab at a labor union suspected of having Communist ties. Riding widespread discontent with the postwar economic policies of the Harry Truman administration, Republicans on this date recaptured majority control of the House from Democrats for the first time in 15 years. The GOP gained 55 seats for a 246 to 188 advantage (with an additional third-party Member). Though Republican control of the chamber lasted only one Congress, the large class of 91 freshman Members who entered the 80th Congress (1947–1949), included a distinguished group of individuals—some of whom remained mainstays of American politics for decades. Among the first-term Representatives were future Speaker of the House Carl Albert of Oklahoma and Frederick A.C. Muhlenberg of Pennsylvania—the great-great-grandnephew of the first House Speaker. Others included future House Public Works Committee Chairman John Blatnik of Minnesota, future Senators Jacob Javits of New York and George Smathers of Florida, and Katharine St. George of New York, who became the first woman ever to serve on the influential House Rules Committee. The new class also included two future Presidents: John F. Kennedy of Massachusetts and Richard M. Nixon of California. Kennedy won election to a seat vacated by James M. Curley who had announced his intention to run (successfully) for a fourth term as mayor of Boston. In his Boston-centered district, Kennedy defeated perennial GOP candidate Lester Bowen with 72 percent of the vote. Nixon benefitted from the Republican electoral groundswell, engineering an upset victory over five-term veteran Democrat Jerry Voorhis in a suburban Los Angeles district with a 56 percent majority.